The latest addition to the Sennheiser DECT headest selection, the SD Pro-1 (single speaker) and SD Pro-2 (two speakers) are almost identical to the DW Pro-1 and Pro-2 series but with a slightly improved base/docking station. Like the DW series, these are designed to work with either your wired telephone or your computer. When used with a computer, they work beautifully with speech recognition software and also work well as a "softphone". 10/2/2014 – I HAVE THE PRIOR VERSION DECT DW PRO 2 AND I AM MISSING THE USER MANUAL . CAN YOU KINDLY SUPPLY A LINK SO I CAN DOWNLOAD . . . 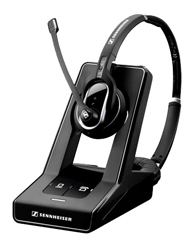 Response From Speech Recognition Solutions: Try this link for the user manual for DW PRO 1 and 2.